I’ve seen firsthand the lionfish of Panama and, not saying this at all lightly, the problems they pose are of biblical proportions. The challenges in Panama also perfectly reflect the seemingly insurmountable problems that all Central American countries with Caribbean coastlines face today and will struggle with in the decades to come. It is undeniable, the exploding lionfish populations are having very real affects on the fisheries and the often poor and isolated communities that depend upon them for food and to eek out a meager living. Don’t get me wrong, even “1st world” areas are suffering under the weight of the rapid lionfish distribution. The first challenge in Panama is one of infrastructure… very little of the Caribbean coastline is realistically accessible by land – maybe 5%. There are no viable roads that run the length of the northern coast… just jungle. There are essentially only two areas of the country that have dive centers, Portobelo (center of the country) and Bocas del Toro (to the extreme west); neither is a mecca for diving and by road they are a 14 hour drive apart. 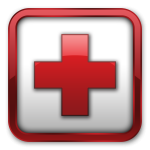 In both areas, the dive shops understand the problem and are doing the best they can. Bocas del Toro is a renowned area for small resorts and eco lodges that primarily cater to affluent Americans. There are sailing and boat charters but the primary on-water activity is big game sport fishing. The main thrust of divers that go to Bocas del Toro prefer to look at pretty fish and take pictures, not be out mucking with the potentially dangerous lionfish. The locals understand the problem, kill and eat the fish and some restaurants serve them up as well. Still, if you look at the amount of coastline in that area, an archipelago, it is just too much to be covered by the relatively few people who care or benefit enough to hunt them. 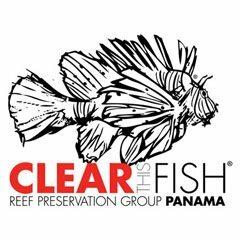 For the time being I am diving just outside of Portobelo and working with Gabriel Lopez Dupuis, the director of a group called Clear This Fish Reef Preservation Group of Panama. Members hunt the dive sites of Portobelo just about every week and are promoting lionfish as a sustainable and inexpensive food source via community outreach. You can find Gabriel posting to our facebook page or through the Clear This Fish website. Portobelo is a very small area, when considering the size of Panama, and most of the diving takes place in a few spots that are a 10 or 15 minute boat ride from the dive shops. There are no fishing or sailing charters in Portobelo that I can find – just a few water taxis that run beach-goers (mostly locals) out to a couple of islands that have small beaches. While there are a few tiny hotels here, mainstream tourism in Portobelo will not take off anytime in the foreseeable future; the town is run-down and dirty, the region averages well over 10 inches of rain a month for 10 of the year and there is no reason for tourists to be there on vacation other than the diving. The port town of Colon is just 20 miles to the west of Portobelo but is really out of the question as a center from which to dive. It is a busy industrial port on the Caribbean side of the Panama Canal and a NOTORIOUSLY dangerous city outside of the “free zone.” There are no local dive centers there. Protected indigenous Indians of Panama, the Kuna, occupy small isolated villages on the Caribbean coast and in the San Blas Islands (Kuna Yala), an archipelago of 378 islands and cays, a little more than 100 miles to the east. Tourism consists mainly of cultural tours that take small numbers of people into the villages to see the Kuna and buy souvenirs. The Kuna are highly accomplished fishermen but refer to lionfish as “devilfish” and avoid them at all costs. They do not hunt them, do not eat them and wouldn’t even if the knew how. Their fear of lionfish is well-known. Additionally, scuba diving is prohibited in the Kuna Yala unless you are with the only dive center allowed to scuba dive in the archipelago, Caribbean Jimmy’s. Freediving (snorkeling), however, is permitted. Long-time family friends of mine, who live on their sailboat and are in San Blas now, tell me that a fellow cruiser is spearing dozens of lionfish in as little as 30 minutes every time she gets into the water. Outside of the dive communities in Portobelo and Bocas, there is ZERO sense of urgency on the part of the locals to worry about the fish. 99% of commercial fishing takes place on the Pacific side of the country and 90% of all fish fillets you’ll find on a plate is “Corvina” from the Pacific (and may be being farmed). I do not get the sense that the government has gotten involved or will in any meaningful way. The Smithsonian Institute is doing research and has offered Clear This Fish a little bit of support. There is well over 1,000 kilometers (600 miles) of Caribbean coastline, pristine habitat for lionfish, and maybe 2% of that area is even reasonably within the reach of divers. Panama is not alone in their relatively hopeless fight against the lionfish, however. One just needs to look anywhere along the mainland coasts of Honduras, Nicaragua, Costa Rica, Panama and Columbia to realize that there is too much inaccessible coastline and NO WHERE NEAR enough hunters to realistically imagine even a weak response in these areas. No, I’m not suggesting that we establish an actual lionfish sanctuary, the title a bit more in line with my own sense of humor at times and only reflects that these areas represent a sort of safe haven for lionfish due to the inability to actively manage their numbers. I envision that only the unimaginable catastrophe of a complete collapse of the fisheries in these areas will have any noticeable affect at all as it might literally starve the lionfish to death and cause any of the remaining larger potential predators that can eat them (grouper, snapper, triggerfish, eels and sharks) with little apparent adverse affect to HAVE to look at lionfish as their only remaining source of food. Otherwise, evolutionary shifts in behavior can take thousands of years to nudge the tiniest bit. Lionfish come in and eat all of the native fish and sea life. These fish were necessary for the health of the reef and local underwater eco-system. The reef dies. No more fish. People who relied upon these fish to eat and make a living then starve. Regardless of just how bad the situation sometimes looks, we must NOT GIVE UP! Scientific studies PROVE that where lionfish culls are concentrated and maintained, native fish species will return and rebound in a relatively short amount of time. We MAKE A DIFFERENCE. YOU CAN MAKE A DIFFERENCE, TOO. KILL LIONFISH! What are your thoughts about these unreachable lionfish? Is there a novel solution? Please leave us your comments below. They live down to 800 feet, and are the most numerous at 200-500 feet , therefore most of their habitat is out of reach of divers, even the most heavily dove areas. The are the ultimate sustainable seafood! There is video evidence showing lionfish at depths of 1000 feet. Yikes! How many eggs do they lay? And is it true that they can reproduce every 55 days!? A female lionfish can release between 10,000 and 30,000 unfertilized eggs every 4 days year around, approximately 2 MILLION eggs per year, in South Florida and warmer Caribbean waters but possibly only spawn 3 to 4 months a year in colder waters. She will typically release 2 egg sacs that are between 1 and 2 inches long every spawn. Francis, correct me if I am wrong. 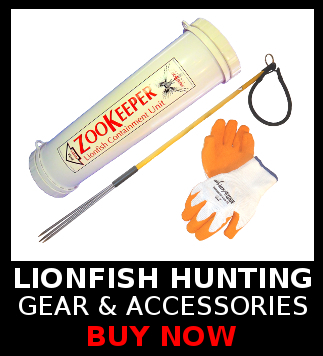 I read that spear-hunting for lion-fish is now allowed in the Bahamas. I love scuba diving, and love it even more to be able to contribute something to the preservation of sea lives while at it. I have yet to dive in the Bahamas, and looking forward to doing so, soon. I live in Cozumel where I learned about the problem of lion fish. My philosophy is: One lion fish killed is one lion fish less left to procreate! My best to your brothers. Cheers! yes, you can hunt them, but only with a sling spear and not in Exumas park. I’ve just come back from Cuba where there are superb reefs, but also a LOT of lionfish. The Cubans don’t seem to be aware of the problems of lionfish (I guess they have more important issues to worry about), so rarely hunt them. We did however encounter an enlightened dive crew who caught and cooked some for lunch for us – they were delicious. I just watched a documentory on the subject and plan to spear my share while exploring Panama next month. May I volunteer my skills as a free diver? I am bringing my own gear. Are you still working on this cause? I am here in PC right now and I am a spearfisher from Canada who was inspired to try and help somehow. I am in Panama for a month and have with me my skin diving gear and speargun..Heading to Bocas tomorrow but can be in Portobello real soon! Gulf unmanned systems center has developed a systems of systems approach to harvesting and monitoring lion Fisk developing a new type of fisheries.please contact me @ 850 630 9801.